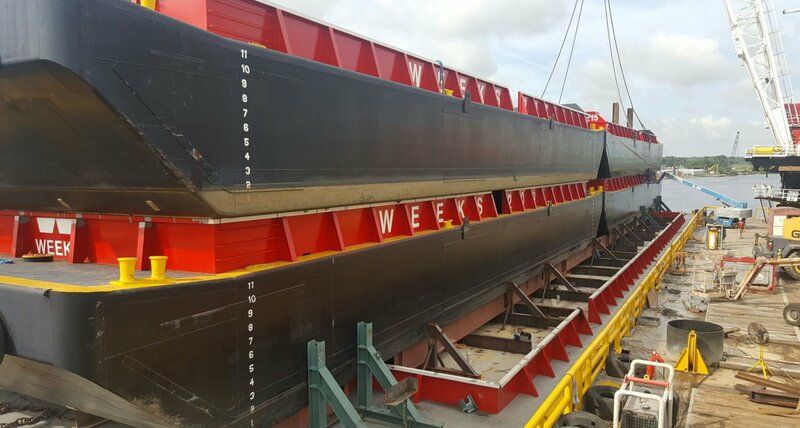 Weeks Marine had contracted the construction of 8 new sand scow barges to be built at a Gulf of Mexico shipyard and was exploring the most economical ways to transport them to Weeks Marine’s New Jersey facilities. Each of the scows measure 150’x40’x12’. In engineering consultation with JMS Naval Architects, Weeks decided to use an existing Weeks Marine Load Line deck barge WEEKS 99 and carry 4 barges at-a-time (double-stacked) on her deck, secure them for ocean tow, and transport them from the Gulf of Mexico to New Jersey. The WEEKS 99 is a converted oil tank barge measuring 300’x72’x19’ that had undergone modifications to increase its width to 72’. 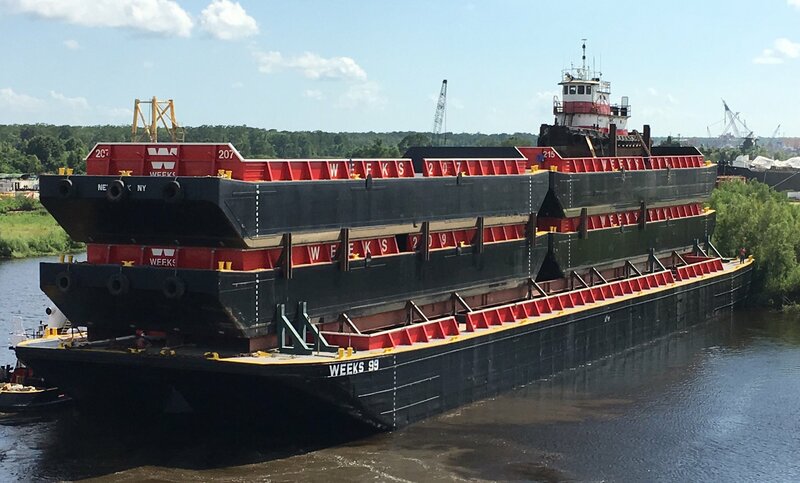 JMS provided design and engineering services to Weeks Marine for transporting the scow barges onboard the WEEKS 99 deck barge. JMS performed calculations and developed drawings for a shipping, blocking, and sea fastening plan and to support the required modifications to the WEEKS 99 to support and secure the 4 new sand scow barges to the WEEKS 99 deck. Modifications included an analysis of using her new bin walls to support the sand scows during shipping. JMS performed similar calculations and drawings to carry, as additional cargo, the Weeks Marine tug GEORGE W on top of the second-tier of sand scow barges. JMS updating the stability documents for the WEEKS 99 following modifications to also allow it to be used as a scow barge after the transportation of the smaller scows and tug was completed. JMS performed a deadweight survey, stability analysis, and submitted the results to ABS for review and issuance of a new stability letter for the WEEKS 99. 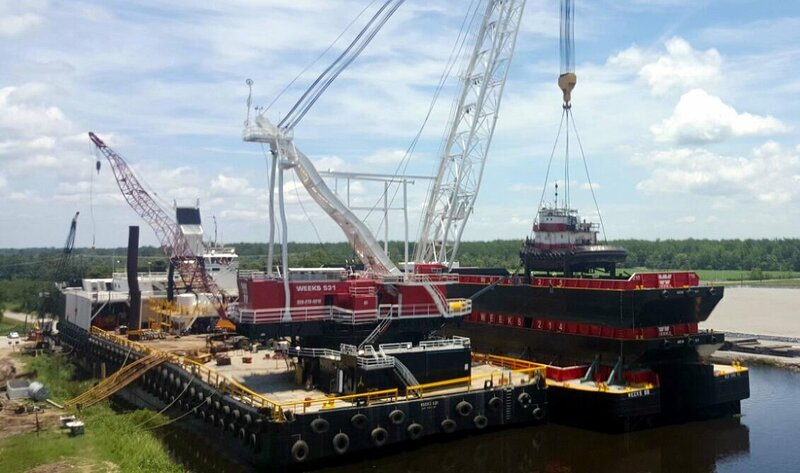 JMS also performed calculations to support modifying and converting the WEEKS 99 from a deck barge to a hopper barge. The WEEKS 99, carrying 4 of the new sand scow barges and the Weeks Marine tug GEORGE W, will be departing the Gulf of Mexico headed for Weeks Marine’s New Jersey facilities this month.